Holger got the idea that a perpetual struggle went on between primeval forces of Law and Chaos. No, not forces exactly. Modes of existence? A terrestrial reflection of the spiritual conflict between heaven and hell? In any case, humans were the chief agents on earth of Law, though most of them were so only unconsciously and some, witches and warlocks and evildoers, had sold out to Chaos. A few nonhuman beings also stood for Law. Ranged against them were almost the whole Middle World, which seemed to include realms like Faerie, Trollheim, and the Giants--an actual creation of Chaos. Wars among men, such as the long-drawn struggle between the Saracens and the Holy Empire, aided Chaos; under Law all men would live in peace and order and that liberty which only Law could give meaning. But this was so alien to the Middle Worlders that they were forever working to prevent it and extend their own shadowy dominion. That's pretty much OD&D-style alignment in a nutshell, or at least how I read the admittedly vague text on the subject. The term "alignment" doesn't appear once in Chainmail or its fantasy supplement, but those rules do divide figures into the categories of "Law," "Neutral," and "Chaos" as "a general guide for the wargamer designing orders of battle involving fantastic creatures." These categories serve a primarily practical purpose in helping players of Chainmail to select units that could plausibly fight side by side. There's no explicit explanation of what the category names mean beyond the obvious fact that Law and Chaos are opposed, while Neutral beings might join other side, depending on circumstances. One could reasonably equate "Law" with goodness and "Chaos" with evil from context, but neither is stated outright in the text. They are just two "sides," no different perhaps than "Romans" and "Gauls" in an ancient world wargame. Characters may be lawful (good or evil), neutral or chaotic (good or evil). Lawful characters always act according to a highly regulated code of behavior, whether for good or evil. Chaotic characters ore quite unpredictable and con not be depended upon to do anything except the unexpected - they are often, but not always, evil. Neutral characters. such as all thieves, are motivated by self interest and may steal from their companions or betray them if it is in their own best interest. Players may choose any alignment they wont and need not reveal it to others. Note that the code of lawful good characters insures that they would tell everyone that they are lawful. There are some magical items that can be used only by one alignment of characters. If the Dungeon Master feels that a character has begun to behave in a manner inconsistent with his declared alignment he may rule that he or she has changed alignment and penalize the character with a loss of experience points. An example of such behavior would be a "good" character who kills or tortures a prisoner. Here we see not only greater definition of alignment, with practical and mechanical examples, but also a shift away from the "us vs. them" approach of Chainmail and OD&D and into something that prescribes and proscribes behavior. Holmes also introduces the know alignment spell. Of course, predating Holmes was an article in the February 1976 issue of The Strategic Review by Gary Gygax. Entitled "The Meaning of Law and Chaos in Dungeons & Dragons and Their Relationships to Good and Evil," it's a very odd piece. I posted the chart that accompanies it in an earlier entry. The article basically argues that alignment is much misunderstood in OD&D and that it needs to be clarified by adding the categories of "Good" and "Evil" so that there are now five alignments rather than just three. 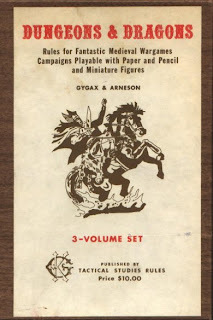 Gygax goes on to note that "While they [i.e. Law and Chaos -- JDM] are nothing if not opposites, they are neither good nor evil in their definitions." He also notes that, in settings that emphasize the showdown between Law and Chaos, Chaotic Good and Chaotic Evil creatures ultimately both serve the same end, namely anarchy and lawlessness and would, to some degree, cooperate to prevent the ascendancy of Law. Of course, he goes on to say that, "Barring such a showdown, however, it is far more plausible that those creatures predisposed to good actions will tend to ally themselves against any threat of evil, while creatures of evil will likewise make (uneasy) alliance in order to gain some mutually beneficial end." The Strategic Review article also marks a shift in its imputation of an ethical/moral dimension to alignment. Indeed, one of the purposes of the article is to delineate the characteristics of Law, Chaos, Good, and Evil so that a referee might track a character's behavior on a chart to determine how closely he hews to his stated alignment, with repercussions should he stray too far. To this, Gygax adds, "Alignment does not preclude actions which typify a different alignment, but such actions will necessarily affect the position of the character performing them, and the class or the alignment of the character in question can change due to such actions, unless counter-deeds are performed to balance things." I distinctly recall playing in games where players took this to heart in a very literal way, doing equal and opposite things to ensure they "remained Neutral." Despite this, some questions remain murky. Gygax says that "law and chaos are not subject to interpretation in their ultimate meanings of order and disorder respectively, but good and evil are not absolutes but must be judged from a frame of reference, some ethos. The placement of creatures on the chart of Illustration II. reflects the ethos of this author to some extent." [italics mine -- JDM] That's quite a bombshell, if you ask me, and one that adds several new wrinkles to attempts to grapple with the meaning of alignment in OD&D, the most important of which being that, at least in 1976, Gary felt the game required that it be seen through some lens that the players and referee brought to it on questions of good and evil. I can't help but find that remarkable, assuming I am reading him correctly. I haven't had the pleasure of interviewing Erol Otus, but Matt Staggs did and the results are available here. There's a reason why I have such a soft spot for Judges Guild and it's not just because, even 30 years later, their best products favorably compare with anything that's been produced since. It's because they're a window into the hobby as it was played in the early days. There's remarkably little artifice to most JG products. What they contain they contain because the writer thought it was cool and, more than likely, because he'd used it (or something similar) in his home campaign. There's nary a whiff of an agenda or theory behind these books, to both their benefit and detriment. A good case in point is 1978's Ready Ref Sheets. This is in fact the expanded second edition of the product, the original having come out a year earlier. 56 pages in length, the Ready Ref Sheets, as its name implies, is a miscellany of charts, tables, and optional rules for use by referees of Dungeons & Dragons. 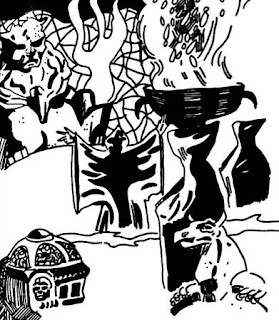 The majority of this miscellany comes the first six issues of Judges Guild's Guildmember subscription, supplemented by material from the Campaign Hexagon System booklet and other JG products. You'll note that this edition is listed as "Volume I," but, so far as I know, there was never a Volume II. A new system for initiative based on "weapon priority"
As you can see, it's a real mixed bag of ideas and I shudder to think of playing in a campaign that used all of these charts. Of course, I doubt anyone ever would. Instead, they're intended as spurs to the imagination, something to which a referee can turn in those moments when he doesn't quite know what happens next in his campaign. It's here, I think, that a key bit of wisdom from the past reveals itself. Lots of contemporary gamers will make the claim that they lack either the time or confidence to run a proper sandbox-style campaign. Being able to think up encounters or details on the spot can be difficult, no question, but it's not as if the referees of the past were made of sterner stuff than are those of today. What they had, though, was recourse to dozens upon dozens of random tables for every occasion -- just look at the AD&D Dungeon Masters Guide! Modern gamers frequently turn up their nose at this stuff, but they shouldn't, since it's these tables that allowed earlier referees to wing it with much greater ease. I know I regularly used tables in the Ready Ref Sheets as aids to my imagination and am glad I did. I often think that the old school movement would be wise to produce a book much like this one, geared toward providing gamers with the tables and charts they need to help shoulder some of the burden of our preferred play style. Properly presented, such a book might even be of interest to gamers outside our little corner of the hobby and go some way toward clarifying just why we love randomness as much as we do. You can read a brief interview on Lulu.com with Ignatius Ümlaut, the editor of Fight On! here. 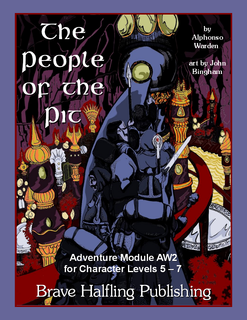 The People of the Pit is, quite simply, one of the more interesting adventure modules to come out of the old school renaissance. Written by Alphonso Warden and published by Brave Halfling, this 42-page product retails for $10.00. Though written for OSRIC characters of levels 5-7, it's easily adaptable to characters of higher or lower levels, as well as to other fantasy RPGs. In terms of its production values, The People of the Pit is probably the most attractive Brave Halfling product I've seen so far. Though it retains the two-column layout of earlier products, the dense text is broken up by a dozen pieces of superb black and white art by John Bingham, all of which have a terrific old school feel to them, from the hideousness of the eponymous People of the Pit to the adventurers and their pack mules preparing to face them. I also appreciated the fact that the cover does not ape the appearance of old AD&D modules, instead opting for a unique look. Also included are four removable maps, all of which have a slightly pixelated appearance. They're serviceable but not particularly attractive. The text itself is well-written and clear. I noticed no obvious editorial glitches beyond the fact that the module can't seem to decide whether its title includes the definite article or not, with the outside and inside covers disagreeing with another on this matter. As one might expect from its title, The People of the Pit draws on the 1918 Abraham Merritt short story of the same name for inspiration. Indeed, the module's text uses quotes from Merritt's work to good effect throughout. As one might expect, I was quite pleased to see this, since Merritt is both an under-appreciated fantasist generally but also an under-appreciated influence on D&D. Gygax specifically places him alongside Howard, Leiber, and Vance, as one of the "most immediate influences on AD&D" in Appendix N of the Dungeon Masters Guide. Fortunately, some people are making an effort to bring Merritt out of the shadows and expose a new generation to his fervent imagination and luxurious language. The module itself is an open-ended one, providing multiple means by which the characters can become involved in it, as well by which they can proceed once involved. All of these events point them toward the City of the Pit, a subterranean city inhabited not only by the loathsome, slug-like People of the Pit, but also their human and demihuman slaves, as well as abominable hybrid beings that serve as the priesthood of the God of the Pit. The People's regular communion with the God of the Pit is what enables these other-planar beings to remain on the Prime Material Plane. Cutting them off from that communion would thus cast them out of the world and eliminate the threat they pose to it. Long-time D&D fans may experience moments of déjà vu while playing this module, since the City of the Pit bears many similarities to the drow metropolis of Erelhei-Cinlu from The Vault of the Drow -- except, of course, that it's likely Erelhei-Cinlu is in fact an echo of Merritt's work, given how highly Gary regarded the writer. That said, the City of the Pit is far less of a mini-sandbox than was the drow city; it's more like a small subterranean wilderness area, complete with its own wandering monster table. That's not a criticism so much as an acknowledgment that The People of the Pit feels more like a single-use module rather than as a touchstone for further adventures. That's probably just a failure of imagination on my part, though, since there are enough loose ends and "rough edges" for clever referees to pick up and use as the basis for follow-up adventures. If I have any complaints about The People of the Pit, they're minor ones. First, I wasn't especially fond of the unsubtle references to Abraham Merritt (the Kingdom of Merritt under the leadership of a chieftain called Abraham, for example). In my own Dwimmermount campaign, there's a decadent, subterranean race of men called the Tirrem, a name I feel is a bit less obvious while nevertheless honoring their origins. Second, the adventure includes two "timed events," which are basically encounters that occur independent of character action but according to the passage of time instead. Both these events foreshadow things the PCs may encounter later in the module. For some reason, their presentation irked me. Perhaps it's because I think they might have worked better as entries on a random encounter table rather than as examples of auctorial fiat. That said, these are both minor issues in what is otherwise an excellent, atmospheric module that draws heavily on the game's pulp fantasy roots. Would that more old school adventures were as remarkable as this one. In case you haven't seen it yet, here's a short fan-produced film that dramatizes the Robert E. Howard poem, "The Return of Sir Richard Grenville." Gary Gygax didn't specifically list the 1963 Andre Norton novel, Witch World, as an influence on Dungeons & Dragons in the Dungeon Masters Guide, but I find it hard to imagine he hadn't read it. 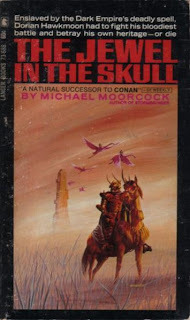 And while I wouldn't argue that the book was the primary inspiration for anything in the game, the general tone and setting of the novel are very much in line with the older pulp fantasies that did inspire Gygax and Arneson. Witch World tells the story of Lt. Colonel Simon Tregarth, a dishonorably discharged World War II soldier, who runs afoul of organized crime and finds himself running for his life. Through the agency of a man renowned for helping people "disappear," Tregarth finds himself transported to another world, one where magic is real and strange cultures abound. This world gives Tregarth a second chance at life and he embraces it with great zest, entering the service of one of the world's many nations and falling in love with a practitioner of magic, Jaelithe, with whom he develops an unusual -- and potentially dangerous -- link. Witch World is very much a descendant of the sword-and-planet genre exemplified by Edgar Rice Burroughs's Barsoom tales and his imitators. Here, as in its precursors, a man from our world travels a parallel one where he finds himself possessed of power and influence unlike any he's ever known. His appearance is literally revolutionary, setting into motion a great change in the established order of his adopted world. The book also freely mixes magic and technology, as the main antagonists of the book are technologically advanced refugees from yet another world. Indeed, Witch World presents a setting in which comparatively few of its inhabitants are in fact natives, with the others having come to it just as Tregarth himself did. 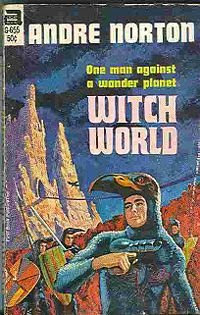 Witch World proved to be Norton's most successful book, spawning not just sequels to the original but all manner of spin-offs, many of them not written by Norton herself. I think many of these later efforts are less "primal" than Witch World and deal with stories and themes that I frankly find uninteresting and that aren't particularly inspirational for the kind of D&D games I prefer. But the original remains a classic and is well worth a read, if you haven't done so. Andre Norton was a very fine writer and her best tales are rightly regarded as among the best in the genre. Witch World is one of them. Allow me to propose a heretical thought: Dungeons & Dragons has too many monsters . I think, deep down, we all know this is true, but let's consider it more carefully. The first AD&D book I bought, shortly after Christmas 1979, was the Monster Manual. I ordered it from the Sears catalog, if you can believe it. Talk about a different world. And, of course, I loved the book, spending hours and hours reading and re-reading its entries and poring over its illustrations (and not just the succubus). In many ways, it was probably the singlemost important D&D book I ever owned. Yet, if I were to go through the book systematically and check off every monster within its 112 pages that I'd ever used in an adventure, I conservatively estimate that it'd be no more than half of them. If I expanded my search to include both the Fiend Folio and Monster Manual II, I suspect that percentage would drop well below 50%. Why is this? Part of it is that, even in my younger days, my conception of the D&D "world" was always a measured one. That is, I strove for some degree of plausibility and that meant I had to reject the inclusion of certain monsters, either because they were simply too outlandish for me or because I already had more than enough monsters in a given ecological niche. As you can see, Gygaxian naturalism isn't something I just made up for a blog post, but something I intuited from reading D&D itself, including the Monster Manual. In the breadth and depth of its entries, the Monster Manual gave me the tools to be able to create a coherent world, at least within the bounds of the shared fantasy of the game. I had a full array of predators, prey, and scavengers to build multiple fantastic ecologies and indeed did so. Now, one one level, that's a wonderful thing, because it meant the Monster Manual was a true "toolkit" book, providng referees with a wide array of tools for almost any job, including many jobs they'll never undertake. Had the Monster Manual been the only monster book for AD&D, I probably wouldn't have proposed my heretical thought. The problem only really becomes clear once you start adding more and more monster books to the game, the end result of which is a rising tide of incoherence, at least if you try and find a place for all the monsters in these books. More than that, though, I think a smaller selection of monsters provides a stronger foundation for building a fantasy setting. Including too many monsters is a great temptation, even for experienced referees; doing so runs the risk of overwhelming the "groundedness" that I feel is vital to a good fantasy. Likewise, monsters, like magic items, lose much of their appeal when they become merely entries in a catalog rather than occasions for wonder. As D&D acquired ever more monsters in hardcover format, this became a problem I encountered often, both in my own campaigns and in those of my friends and acquaintances. For myself, I must admit to preferring the smaller monster lists of the three little brown books, Holmes, and Moldvay/Cook. Their listings are broad enough to give a lot of variety and deep enough to challenge characters of many levels of experience. To these lists can be added individual "specialty monsters" on an adventure-by-adventure basis rather than in the more magisterial approach favored by the AD&D hardbacks. I personally think this approach is more easily manageable, leads to greater coherence, and contributes to that sense of wonder that the best fantasy engenders in us. Lest there be any misunderstandings, I am most emphatically not saying I hate monsters, monster books, or the original Monster Manual. Judging from past experience, some people take what I say in my musings to be dogmatic statements when they are in fact tentative thoughts expressing my current (often incomplete) feelings on a given subject. In this case, my feeling is simply that, far from losing anything, D&D would probably gain a great deal in terms of focus, consistency, and fidelity to its pulp fantasy literary forebears, if it pared down the list of its monsters to something much smaller than the bloated mess it acquired over the years. I'm on record as not being a big fan of Bill Willingham's art because I've always found it too "comic book-y" for my tastes. I realize I'm in the minority in holding this opinion, as most people have great fondness for Willingham's art. On some level, I suppose it's because I've never actually been a huge fan of comic books. I've read some over the years and enjoyed them and, even now, I occasionaly pick up collections or graphic novels that people recommend to me. But I'm not deeply versed in comics lore nor did I collect them as a kid. Until recently, I never felt as if I were missing out on anything. Based on comments made in various places, I'm realizing that Marvel comics from the late 60s and early 70s were a significant influence on the early hobby. 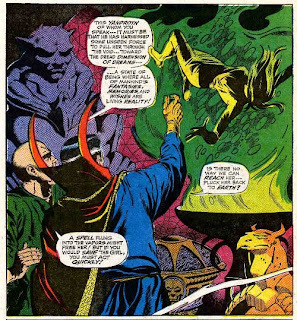 For example, it was once noted that Brian Blume was a fan of Doctor Strange and that the psionics system presented in Eldritch Wizardry may have been an attempt to introduce a Doctor Strange-like magic system into OD&D. 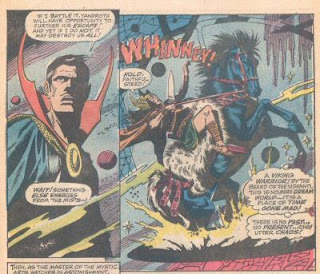 Likewise, Ken St. Andre, creator of Tunnels & Trolls, stated in a 1983 interview that "my conception of the T&T world was based on The Lord of The Rings as it would have been done by Marvel Comics in 1974." Does anyone else have any examples of Marvel comics influences over the early hobby, not just in terms of artwork -- though that's useful too -- but in terms of ideas and concepts? I can't shake the feeling now that there are many more out there than we realize. 5. I also recall seeing your artwork in a couple of GDW's Traveller products, most notably The Traveller Adventure, which remains a favorite of mine. Did you find illustrating a science fiction RPG more challenging than illustrating a fantasy one? I did quite a lot for GDW, actually — they were one of my primary clients for many years. As a reader of the science fiction/fantasy genre as a kid, I preferred hard science fiction to fantasy. It wasn’t until I stumbled on Fritz Leiber’s Fafhrd and the Grey Mouser than I learned to love fantasy. So I was perfectly happy to illustrate in both genres. That said, the answer to your question is Yes, SF is harder for me than fantasy. Why? Not because one is mushy in terms of research to create believable images but because I am someone who prefers organic shapes. This is a topic I’ve discussed with other artists, and I find most artists have a decided preference — either for mechanicals or for organics. We can learn to do either, but one takes more effort. For me, mechanical things are hard. I just don’t “see” them. Moreover, because one of my early influences was Art Nouveau and the likes of Aubrey Beardsley, my work has a strong “graphic design” look. Shape and flow are often where I start a drawing’s idea, so perspective took some retroactive learning on my part — particularly because I was almost entirely self-educated in art. (My bachelor’s was Anthropology.) It is extraordinarily difficult to do convincing mechanicals until you know about perspective and vanishing points, and are willing to use a straightedge or other such tools. 6. You've continued to do gaming projects over the last 30 years. I take it that the hobby is still something you enjoy participating in? I certainly do. The hobby has done much to shape my life and while I’ve rarely been a high profile “personality,” I have always considered myself a gamer and working professional in the field. The last half-dozen years I was as distant from the hobby as at any time in my life and career. Everything in my life was in transition and almost all of it was exceedingly unpleasant and problematic. Now things have re-stabilized after far too long, and I’m glad to say that working in the hobby again is one of the things I’m enjoying getting back to. It’s not the same as it was before, but I am as excited by what I’m doing now as I was when I started my career at 20-something. It’s not many people who get to do two wonderful things in their lives, and I am incredibly lucky in that respect. 7. My wife is a school librarian and was very excited when I told her about the project you're doing with the American Library Association. Can you tell us a bit about that project? That’s what is so amazing about where I am right now. This is a LONG story, so you’ll have to bear with me. Twenty, twenty-five years ago, libraries and schools met gamers at the gates with pitchforks and torches. D&D was castigated as the devil’s work, Magic cards made kids into thieves and muggers, and the nascent video games were destroying children’s minds and morals — if you believed all the bad press. Flash forward to the present, and the gamer generation grew up to become good citizens, attentive parents, desirable employees and respected entrepreneurs. For the last ten years or more, academia has been studying gamers — the video game generation mostly, but the older gamer crowd has gotten some attention also. What they’re finding, with reports released in peer-reviewed journals and at major conferences, is that by and large gaming can be very good for you. It develops a variety of cognitive processing skills; the MMORPGs develop leadership skills without regard to age, gender, or social demographics; the FPS games improve spatial processing skills important to engineers and scientists of various types; many games including RPGs enhance understanding of math, economics, and teamwork; and so much more. Games are strongly social, not isolating, and most people play with friends and family preferentially, whether in the same room or across great distances. The stories I hear that make me smile most are about parents who play games with their sons and daughters. Not only is that smart parenting, it is just plain fun for everyone concerned. Gaming of all kinds encourages reading and literacy even if you consider only printed matter to be “literacy.” There are countless tie-in books, graphic novels, strategy guides and cheat code books about almost every game ever made. The Pokémon cards rely on multiple nested conditional sentences well above the average reading level for the youngest kids playing the game — their motivation to do well in the game raises their motivation to acquire the vocabulary and parse the sentence construction. Several of the New York Times bestselling authors of today learned their craft writing for games first; I edited work by both Michael Stackpole and RA Salvatore in their earliest gaming days, before they had a single novel out. Ray Feist, Margaret Weis, and Kevin Anderson would have had quite different careers but for gaming. Today, fanfiction.net has tens of thousands of stories inspired by games and game worlds (Final Fantasy alone appears to have about 40,000 stories), and that is just one website! The converse is also true; through games you can explore the worlds created by authors like HP Lovecraft, Robert E Howard, and of course JRR Tolkien, to name just a few. Further, if you look into the “21st Century learning skills” as outlined by the influential The Partnership for a 21st Century Skills, then gaming encourages most of the key technological literacies that tomorrow’s citizens and employees will need to succeed. The 21st C learning skills are of particular interest to me. Right now I am completing a research survey on how some of these skills might be acquired in WoW and their transference to real life. Results are mixed about WoW in particular, in part because a number of respondents are telling me they learned the skills in other games, particularly the RPGs. The positive anecdotal evidence I’m hearing is astounding: people telling me some truly amazing stories about what a positive impact the game has had on their lives: medical techs who feel they keep a more level head under pressure during surgery because of their experience in PvP; how a guild’s best raid leader — the tactician and strategy communicator leading up to 40 players into difficult conditions — turned out to be an 11-year old boy; how many women find themselves guild leaders when they’ve never been “leaders” of anything before. Over and over again, people talk about what deep and abiding friendships they’ve made through the game, friends they have since gotten to know well who they have since met face to face in real life. WoW gets a lot of bad press because it is a highly engaging, immersive game that can eat your free time and all your attention if you don’t have time management skills and understand the need to balance it as part of your whole life — but those also are skills you’ll learn in WoW if you don’t enter the game having them! What does all this have to do with the American Library Association? I only remembered the BADD old days and was frankly astonished how much had changed. The Techsource Symposium opened my eyes to how far libraries had come, and I got to meet some of those leading the change, visionaries like Jenny Levine and Eli Neiburger and Beth Gallaway. I told Jenny how very impressed I was, and to let me know if there was ever anything I could do for her or for ALA since I still had contacts in the game industry and a deep understanding of the profession. To my surprise, she took me up on it. In March of 2008 she and Dale Lipschultz asked if I’d like to work with a dozen others as part of the “grant experts team” being formed to carry out a two-year, million dollar “Libraries, Literacy, and Gaming” grant funded by the Verizon Foundation. Our job was to look at what the best libraries were already doing with gaming in the library, and then fund 10 new libraries to do new or expanded gaming programs. We put together a “best practices” toolkit that libraries everywhere could use, and the 10 funded libraries would let us “playtest,” refine and expand the toolkit too. The team received 390 eligible requests for grant monies when the Request For Proposal went out. It was overwhelming. We had every kind of library coming forward — public, academic, and school libraries, from small towns, large urban areas, tribal libraries, and everything in between. The best 10% were given to the grants team to review — I read 10 proposals myself — and it broke my heart to know that only 10 libraries out of that 390 could be funded. Some were just amazing. As I write this, the winning libraries have been selected and informed, but not yet publicly announced. I am eager to see what has been chosen. I hope that there are ways to acknowledge and perhaps adapt some of the ideas of gaming librarians whose requests didn’t get funded. The energy, drive, and innovation I read in just the 10 proposals I saw were enough to rock me back on my heels. My eyes and hands are getting old, and doing art as much as I used to is growing ever more difficult. I’m a huge adopter of Web 2.0 but not for art, where I’ve found the learning curve just too steep. I still paint and draw largely by hand, although I’m passingly conversant with things like Photoshop and other graphic programs. The fact that I can bring my knowledge of the industry and my love of games and gaming to the service of libraries, which I also have loved for decades, makes an amazingly satisfying combination as I look to the future. For the games industry itself, I’m looking to do more writing and editing, as well as what art jobs cross my path — I can’t give it up entirely and don’t want to! — and I’m also working assertively on fiction writing which I mostly had to abandon in past years, although I expected to be a novelist long before I ever achieved recognition for my artwork. Sometimes life takes you on unusual paths and I’ve always been one to follow my nose to the projects and places that interest me the most. I’ve been lucky enough to find people willing to pay me to do what I love. There could be no better life, I think. Or, as Michael Stephens said (of TametheWeb.com): learn to learn, adapt to change, scan the horizon, be curious, bring your <3 with you. Words to live by, whatever your profession. I've mentioned many times before that I was a huge fan of Traveller back in the day and that I considered The Traveller Adventure one of the few near-perfect products ever made for any roleplaying game in the history of the hobby. Among the many things that made that product so special were its illustrations, many of them created by Liz Danforth. 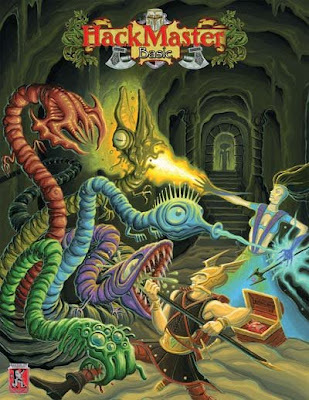 Of course, Liz's illustrations aren't limited to Traveller; she's probably better known for her work on Tunnels & Trolls, with which she's been associated since the game's beginning, at the dawn of the hobby. Liz kindly agred to answer some questions for me, the first part of them being posted here today. Part II will be posted tomorrow. 1. How did you initially become involved in roleplaying games? I was part of the local science fiction club when I was in college, many decades ago. The group included a bunch of board gamers who played Risk, Regatta, and Diplomacy variants, and I enjoyed that. The gamer group included Ken St. Andre, who looked at the original early D&D and felt it was a cool idea but "way too complicated." He created Tunnels & Trolls, and so that is what all of us played. I did illustrations for the early game and eventually worked for Flying Buffalo Inc, the publisher of T&T. Working for Buffalo, I attended many game cons, I met the rest of the industry and did a lot of freelance work for anyone who wanted the skills I had to offer — art, of course, but also writing, editing, game development and scenario design. I had the time of my life, honestly. 2. In the early days, the hobby was a lot more strongly male-dominated than it is now. Did that make working in it more difficult or were those early gamers a lot more open-minded than they're given credit for nowadays? My first Origins — which was about 1976, near as I can recall — it seemed like every guy on the hall was staring at my chest. I was damn near the only female in the place. No one was unkind or truly rude, though. They just couldn’t believe I knew games, played games, or worked for a game company. They all figured I was somebody’s girlfriend, I think. That said, I never ever had problems working in the industry as a female. People could tell I knew what I was talking about after a short time, and were willing to give me exactly the same opportunities they’d give any other artist, writer, or editor. My work spoke for itself and the rare examples of misogyny were just that — very rare. 3. The earliest product I recall seeing your artwork in was Monsters! Monsters! from Metagaming. Did you enjoy working on that book and, if so, why? That was another Ken St. Andre game and me and my gamer friends — Bear Peters, Steve McAllister, Ugly John Carver, and Ken mainly, with a smattering of others — were the ones playing it while he developed the design. We all participated. It was strongly based on T&T but Ken choose to go with Metagaming instead of Flying Buffalo at that particular time. I don’t recall if that was before or after the art I did for Steve Jackson’s early design for Melee (which eventually grew into GURPS), but M!M! was my first color cover for a game, if I remember right. It was a very long time ago! As an aside, Rick Loomis of Flying Buffalo and I are talking about completing the rewrite and re-release of M!M! It seems to have a small but vocal following though it has been out of print for years. Bear Peters did a first draft rewrite (he was always the most wonderful of M!M! GMs, having overseen the burning of Khosht, which was our “home town” for both T&T and M!M! games) and that’s what I’d be working with. I have to put together the next Citybook for Buffalo before I get to M!M! though. 4. For a lot of gamers, your artwork will forever be associated with Flying Buffalo's Tunnels & Trolls. Is T&T still near and dear to your heart? Absolutely! I loved the game then and still do. I also wrote/edited the Fifth Edition which a lot of people tell me they still play. I don’t play face to face RPGs much any more, I admit. Blizzard’s World of Warcraft puts all the dice rolling and charts into the background, and that makes play immediate and seamless. I like that. That said, my old friend Bear refuses to get into the game because you have to kill the monsters instead of being clever and witty; he says he’ll only play an MMORPG when you can wheedle a dragon out of its gold. He’s right, but the old T&T gang has dispersed to different cities as our lives have unfolded — but I can still play with some of my old friends through WoW, regardless of where we now live. Who I play with has always been more important to me than what game I’m playing. That said, I find World of Warcraft deeply engaging and interesting not only as my entertainment but also as a game design, an intellectual property, and a fingerpost to the way gaming will change in the future. I’m conducting some academic research, a byproduct of getting my masters degree, looking at what are called the 21st Century learning skills acquired in WoW that may transfer to real life. The core data isn’t coming together as strongly as I expected — it is excellent but not emphatic — but the anecdotal stories accompanying the survey put me in awe, frankly. People are getting a very great deal more out of the game than mindless entertainment, that’s for darn sure. ... could make a mushroom man this creepy. In some ways, I'm probably the worst person in the world to review a product like Breaking & Entering: A Toolbox for Thieves. Not only am I generally skeptical of the class even in concept, but I also think its presentation in Supplement I opened a game mechanical Pandora's Box, the consequences of which still plague Dungeons & Dragons over 30 years later. Despite that, I'm actually quite fascinated by the thief class, as well as the attachment so gamers have to it. For all my complaints -- and there are many -- I've come round to accepting the fact that, original though it may not be, there certainly is a place for it in D&D, probably even moreso than the cleric, which feels far more like an interloper class than does the thief. So, I purchased Breaking & Entering (written by Vincent Frugé and published by Brave Halfling) in the hope it would give me further insight into the appeal of the thief and the ways gamers use the class. Retailing for $6.00 (though currently on sale for half that), what you get is a 28-page PDF for OSRIC that gives the referee new material to inspire "his or her own unique interpretation of the thief class." The product is thus interesting for a couple of reasons, the first of which being that it's aimed specifically at OSRIC, a departure from Brave Halfling's usual association with Labyrinth Lord, although B&E could easily be used with any old school fantasy RPG. Second, the product seems aimed more at referees than at players, being a toolbox of ideas from which one can pick and choose rather than a unified expansion of the traditional thief class. I have to say that I very much approve of this approach. The product begins by offering up a brief revision and expansion of the thief's climb walls ability, as well as a new sub-system devoted to spying. The spying sub-system is simple and looks easy to use, though I expect it's probably of most use for NPC thieves. Following this, we get several new thief abilities, most of which are clearly inspired by the thief-acrobat specialization from Unearthed Arcana. B&E then moves on to provide two new sub-classes of the thief, beginning with the deep scout, which is basically a good-aligned spy used to infiltrate evil nations and organizations. There's also a new version of the bard, which bears some resemblance to the version presented in another Brave Halfling product but tweaked for use with OSRIC (illusionist and druid spells instead of magic-user ones, for example). Also included is a detailed thieves' guild, complete with map, thief-oriented gods, new equipment, and magic items. The end result is, I must admit, much less of a toolbox and more of a grab bag. That is, Breaking & Entering has no organizing principle beyond being a collection of rules and ideas pertaining to thieves. There's minimal discussion of the advantages and disadvantages of each option presented, instead leaving it to each referee to decide for himself. I don't think that's a bad thing in itself and it's certainly an approach in tune with OSRIC's sensibilities, but it's not one that every referee will like. In addition, some of B&E's content seems a bit lackluster to me, such as the deep scout and the deity write-ups. Given the sale price, I have no cause for complaint, but I do wish the product had felt tighter and less scattershot than it does. A shorter, more focused product might have been more satisfying. There are a number of excellent ideas in B&E but their excellence is obscured somewhat by the presence of what feels like filler text designed to pad out the page count. In my never-ending quest to fill in the gaps in my knowledge of the hobby's history, I've been reading the 1983 edition of Chivalry & Sorcery quite closely. Its treatment of magic (or magick, as it insists on calling it) is remarkable and I suspect I'll be raiding it for ideas in my Dwimmermount campaign. This does not rule out the excitement of an adventure. Only the Magician has some deep motive for going. He stands to learn something new or is attempting to forestall some terrible disaster. He doesn't go for ordinary reasons; for he is not an ordinary man. I won't speak for anyone else, but found these passages quite evocative and compelling. They're a good example of understanding that magic should be, well, magical and not ersatz technology. 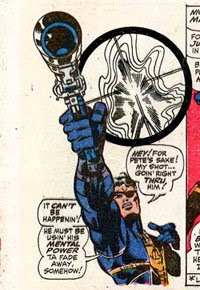 The magic-user in D&D, even in its earliest versions, often strays a little too close to being "a mere weapons technologist" and that's a shame, because nothing about magic should ever be so simple or straightforward. (which I reviewed here) and Swords & Wizardry (or any old school rules set really). This review concerns the latter version only, which I presume is identical to the straight LL version, although, not owning it, I cannot say for certain. Written for characters level 1-2, module is a simple, straightforward adventure that involves the exploration of a 17-room ruined stronghold hidden beneath Witch Hill. As it turns out, these ruins were once held by a militant clerical sect dedicated to the god of light and righteousness, Ramat. They're also the final resting place for the Spear of Ramat, a minor artifact of the sect that a treacherous priest attempted to destroy by means of a magical portal that summoned undead, demons, and worse into the world. Though the Spear was saved, the faithful servants of Ramat were not so lucky. Like most Brave Halfling products, The Ruins of Ramat is an unpretentious, "meat and potatoes" offering. In PDF form, it is 10 pages long, but in its printed form, those pages are folded into two in order to create a small booklet roughly the same size as the little brown OD&D books. The PDF sells for $3.50, while the printed version, which includes shipping, can be purchased for $5.00 (or $6.00 if you live outside North America). This gets you a fun little side adventure that's easily dropped into any campaign, as well as a map and stats for two new monsters (one being the huecuva first seen in the Fiend Folio). One of the nice things about the adventure is that how easily it could serve as a child's introduction to fantasy roleplaying. As presented, the characters are asked by a little girl who's lost her dog to find him, after a clawed creature came up out of the ground of Witch Hill and snatched the canine. Melodramatic though it may be, it's precisely the kind of hook that would grab my nine year-old daughter and I can't imagine she's alone in that regard. 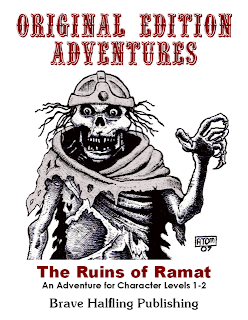 In addition, the backstory about the clerics of Ramat, while useful in establishing a greater context to the ruins, isn't integral to running the adventure -- another plus if you just want to offer up a simple dungeon crawl to young players. That's not to say The Ruins of Ramat offers nothing for more experienced players, but I think the module shines brightest when viewed as an introductory one. Some might argue that Gamma World, written by James M. Ward and Gary Jaquet and first published in 1978, is unintelligible outside the context of the Cold War. There's unquestionably some truth to that. Gamma World's inclusion of mutants and radioactive wastelands is definitely a reflection of Western fears of an apocalyptic World War III that would usher in a new dark age more horrific than any we could imagine. Goodness knows that, as a kid, I more or less expected there to be some final reckoning between the nuclear powers in my lifetime. But I'm pretty sure that's not why Gamma World appealed to me back then. The mutants and the radiation were just window dressing for me, a convenient way to frame what is, I think, a much more primal fascination with the End of the World in a broader sense. Pretty much every human culture that's ever existed has considered itself to be the last one, teetering on the brink of collapse and whose passing will herald the destruction of all that is good and beautiful in the world. It's a peculiar kind of hubris and I don't deny that, for much of my life, I've convinced myself to varying degrees that the End was just around the corner. Morbid though that conviction may be, there's profit in it nonetheless, at least if it makes one consider what's truly significant about one's culture and what bits of it are hardy enough to survive the collapse of its supporting structures. If this all sounds a bit pretentious and highfalutin, perhaps it is, but the Gamma World games I ran as a younger person were filled with moments when the player characters encountered some vestige of The World That Was, resulting in comedy, darkness, and occasionally awe -- far headier stuff than ever occurred in most of my D&D games. That's the power of the post-apocalyptic genre, I think: approaching the present day as if it were a lost civilization whose culture and values are utterly alien to us. I've said before that, in a sense, most pulp fantasies are post-apocalyptic fantasies. Many take place in a fallen world after the oceans drank Atlantis and the gleaming cities. Not only does this set-up lend the weight of history to a setting, it also provides an excuse for ruins to be explored and plundered. As a D&D player, I found Gamma World all too easy to wrap my head around. It's a game that's ready-made for sandbox play and where rootless adventurers moving from one pocket of civilization to another makes perfect sense. In some respects, the implied setting of Gamma World makes a fair bit more sense than does that of D&D and it's eminently gameable. I played a lot of Gamma World once upon a time and have many fond memories of those long-gone campaigns. I still remember a mutant rat PC who died, in a moment I could not have scripted with a straight face, when he ate a container full of Intensity 18 rat poison I rolled up as random treasure from a table in the book. I will also never forget the would-be Knight of Genetic Purity who suffered mutations as a result of exposure to radiation or Davion, the mutant frog, who wore a football helmet and used a shield with arcane word "Yield" emblazoned on it. Despite my musings up above, Gamma World certainly wasn't a deadly serious game, but I think that was part of its charm. Unlike D&D, I was rarely tempted to run Gamma World completely humorlessly. My campaigns tended to careen wildly between low comedy and high adventure, spiced up by dark meditations on the downfall of our world. Perhaps unsurprisingly, I think very highly of Mutant Future and regularly consider running it as a break from the Dwimmermount campaign. I still might one day. Take a gander at the newly posted cover of HackMaster Basic, illustrated by none other than Erol Otus himself. People seem to enjoy the interviews I've done in the past, so you'll be seeing quite a few more in the future. I'm currently in contact with five individuals associated with the early days of the hobby who've all agreed to be interviewed. In some cases, the process of setting up the interviews is taking longer than I'd hoped it would, but I'm patient and willing to wait, since several of these individuals will no doubt have some interesting things to say. One of the goals of this blog, after all, is unearthing as much of the history of the hobby as possible. Since I was a mere child when much of that history happened and because so few people have bothered to record this history, I'm pretty much at the mercy of my sources. So, if you're someone from the early days (1974-1983, in particular) or you know someone from that era, I'd be very interested in interviewing you. 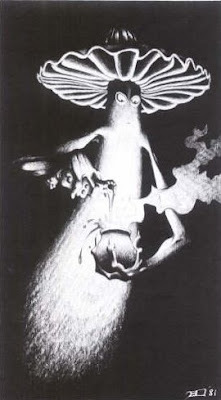 My love for Clark Ashton Smith -- my favorite of the Three Musketeers of Weird Tales -- is rather well-known, which is no doubt why several people directed me toward this article by Adam Ganderson. It's an overview of the life and writings of CAS, most of which is aimed at a general audience. I noted a couple of small inaccuracies in the article, but they don't detract from its essential point, that Smith was a unique literary voice whose like we've rarely seen. Weird Tales and the pulp magazines came along just as magazines––as the centerpiece for popular culture––were going away. Many of the general fiction magazines folded pretty early in the century, but because there wasn’t a lot of weird fiction in radio and movies, the niche magazines, whose circulation was smaller than the general magazines, actually lasted longer. I'm not yet prepared to defend the notion, because I'm still thinking it through and, truthfully, lack the evidence to support it, but I see a parallel with the Golden Age of roleplaying games. There are many differences, of course, not least being that gaming's Golden Age lasted barely a decade rather than two. Even so, I can't help but think that the early success and later mass market popularity of RPGs owes to the fact that it was one of the few outlets for people whose imaginations were fired primarily by fantasy and science fiction. It was rare in the late 70s and early 80s to meet fans of genre fiction who weren't also gamers and certainly the earliest gamers consisted inordinately of people who were already involved in science fiction and fantasy fandom, as my recent interview with Lee Gold makes clear. Hard though it is to believe, in those days, fantasy and science fiction were not as pervasive as they are today. Indeed, the distinction between the two genres was esoteric and not reflected in popular conceptions of them, which tended to lump them into a single broad category. Science fiction/fantasy is a declining literature in the broader sense of pop culture, I think, in part, because [science fiction has] conquered the world. Back in 1982 there were one or two big science fiction films a year if you were lucky. Pretty much every video game that comes out these days is a science fiction plot. Everywhere you look there are science fiction conceits and ideas that 25 years ago were not mainstream. The same holds for roleplaying games, I think, and this may well explain why it is that gaming represents an ever-smaller sub-set of the much larger pool of people who enjoy fantasy and science fiction than was once the case. I don't personally see this as a bad thing in and of itself, but then I'm not trying to find a way to recreate the gaming fad of the 80s. I pity anyone whose job it is, though. The utility and admissibility of skill systems are at the center of a great debate in the old school community, with many grognards being firmly of the opinion that they run counter to the logic behind character classes. What else is a character class but a particular archetype, including that archetype's unique talents and abilities. Make skills independent of classes and you run the risk of blurring the distinctions between classes. Beyond that, skill systems bring with them additional risks. The presence of a standard mechanic for adjudicating non-combat actions makes it an attractive alternative for players who don't wish to describe their characters' actions and would rather trust in the dice than in the good judgment of the referee. Furthermore, taken to an extreme, skills can be interpreted in such a way that they imply that characters without a given skill cannot attempt such actions, an interpretation that elevates skills into a cornerstone of gameplay rather than as an aid to it. While I'm personally in the camp that sees little point in having a skill system in a game like Dungeons & Dragons, I've nevetheless come round to believe that, in the right hands, they can prove useful. That a game mechanic can be abused is insufficient basis for condemning it, which is why I've softened my stance on thieves, for example. They're not something I'd probably allow in my own campaign, but, fortunately, my own tastes aren't normative -- thank goodness! It's with this in mind that I picked up Brave Halfling's 5-page PDF entitled Delving Deeper: Skill Systems. Retailing for only 75 cents, I find it hard to imagine that even the most diehard skill hater would't find it useful as food for thought. That's because author Luke Fleeman openly acknowledges the problems inherent in attaching a skill system to a class-based game. He then stresses that, despite that, skills can work with the class system rather than against it, provided one takes care to avoid some common mistakes. Speaking as a skill skeptic, I found Fleeman's approach refreshing, because it encourages both advocates and naysayers alike to re-examine their stances in a constructive way. 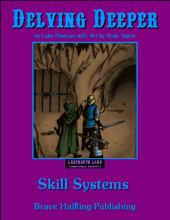 Delving Deeper: Skill Systems first provides a list of 11 skills, ranging from Open, used for forcing open doors and gates, to Persuade, used when trying to convince NPCs of something. Each of these skills is associated with an ability, a feature that becomes important later. The list of skills is a bit odd, since it specifically avoids anything that might overlap with the thief class, as well as "mundane skills like crafting and smithing." I can certainly see the justification for the elimination of craft skills, since I'm not certain the game needs mechanical sub-systems to deal with forging a sword or weaving a basket (though I am open to being convinced otherwise). The thief question, though, is less clear. One of the main objections to the thief is that it promotes exceptionalism, which is to say, the aforementioned "if you don't explicitly have the skill, you can't do it" mentality. If moving silently or hiding can't be treated as skills lest the role of the thief class be undermined, then is not a skill like Arcana, which simulates the occult knowledge a magic-user might rightly possess, similarly out of bounds? If not, why is the thief's skill so privileged? It's here, I think, where Skills Systems falters a bit, even if I fully understand the dilemma the author found himself in. The product offers three different options for how to handle skills, two of which draw on existing mechanics in the game and universalize them, while the third uses a very common house rule to do the same. Option 1 uses a simple D6 roll to determine success or failure, mimicking searches for secret doors. Option 3 uses percentage-based skills similar to a thief's abilities. Option 2 is an ability check that relies on the ability scores associated with a given skill and a D20 roll. All three options provide rules for the initial selection of skills, as well as improvment as the characters gain new levels. Each option also includes a brief discussion of its advantages and disadvantages, a feature I appreciated. Delving Deeper: Skill Systems is not a ground-breaking product nor will it, I think, put an end to the philosophical debates on forums and blogs between old schoolers about the merits of skill systems. It's a modest little product that provides food for thought, along with plenty of options, some of which can be easily retooled for other purposes, such as building new class-based abilities. With its low price, I felt I more than got my money's worth, but it's definitely a niche product that won't appeal to everyone. Don't Buy This If: You have no interest in skill systems or already have a skill system you're happy with. I realize this could be construed as a "religious" post, but, in my defense, I'll point out that, rather than St. Peter, it's a non-denominational angel who waits at the Pearly Gates. Of course, the comic does imply the existence of both the supernatural and the afterlife, so perhaps I've not covered myself as well as I ought to. Ah well, I just thought it was apropos. Yesterday's Dwimmermount session was dominated primarily with investigation rather than combat. The players had become convinced that what they believed to be Level 2 of the dungeon was in fact a small sub-level that they'd thoroughly explored. The only means of further progression was downward, either through a hole in the floor of one room or by means of an odd, magical elevator. Both methods led them downward into a cavernous level at least some of whose chambers were filled with the silvery-black oil they'd encountered elsewhere. Since they weren't keen on this route -- at least not until they'd identified the oil with some certainty -- they decided to return to Level 1 and find a different set of stairs downward to see where they led. Doing so they descended obviously deeper than the sub-level they'd recently explored. Whether this means they're on a level roughly parallel to the sub-level or even further down is still unclear. Not long after doing so they had to contend with some giant spiders, a seemingly common menace in Dwimmermount. Having defeated them, they then set out to map as much of this new level as they could, to get a sense of its size and relative relationship to the levels above. In short order, they discovered that the level seemed quite extensive, with lots of chambers and twisting corridors that went in every direction. A topographical map of what they assumed to be the entire world, with Dwimmermount at its center. A pumping machine that seemed to be processing the black oil into silvery "coins" that were then dropped down a chute to a lower level of the dungeon. The party came across a group of human warriors dressed in armor of an unknown style fashioned from a weird silvery-black metal and wielding large two-handed swords of the same metal. Dordagdonar took one of the swords into his possession. He intends to take it, along with the oil he'd previously collected, to an alchemist in Adamas to see if he can learn something about its nature and origin. He is increasingly convinced that this substance, whatever it is, holds the key to understanding what is going on in Dwimmermount, as well as to determining how the party ought best to proceed. I have a love-hate relationship with Michael Moorcock. I'm frequently attracted to his ideas but only occasionally to his writing, which I find is often sloppy and loose. Likewise, his characters are in equal parts despicable and pathetic, making it hard for me to form the attachments necessary to make my way through his stories. The primary exception to this is Dorian Hawkmoon, who makes his appearance in the 1967 novel, The Jewel in the Skull, the first part of the four-part "History of the Runestaff" series. I not only like Hawkmoon as a character, I also find the series in which he appears a fair bit more coherent than, say, the adventures of Elric. Gary Gygax noted the influence of the Hawkmoon novels over D&D, although, intriguingly, he added "esp. the first three books." When I have more time, it might be worth trying to figure out why he said this. The Jewel in the Skull takes place in "the Tragic Millennium," a post-apocalyptic future in which super-science and magic exist side by side and the world is threatened by the Dark Empire of Granbretan. This places it within a sub-set of swords-and-sorcery novels epitomized by works like The Dying Earth, where the future of our world is portrayed as a fantasy setting. Its protagonist is the aforementioned Dorian Hawkmoon, Duke of Köln, who, while leading a rebellion against the Dark Empire, is captured and offered a chance to escape death: aid Granbretan by acting as its agent in the Kamarg. Hawkmoon accepts this offer, along with a magical black jewel that's placed inside his head, which prevents him from betraying his evil masters. Fortunately for Hawkmoon, the Kamarg's ruler, Count Brass, finds a means to nullify the black jewel temporarily, setting into motion a plan by which he and Hawkmoon can foil Granbretan's nefarious schemes. Like most Moorcock novels, The Jewel in the Skull is full of great ideas, breezily delivered. 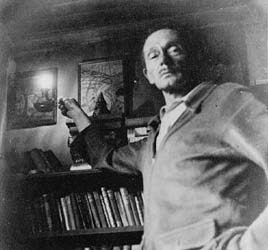 Most of the flaws evident in his other novels are here too, but I found myself quite able to overlook them, because I enjoyed the world and inhabitants Moorcock described. The Tragic Millennium is one of those settings that, while far from ground-breaking, neveretheless achieves a certain power because of the way it appropriates familiar places and names to play with -- and against -- our expectations of them. The result is a world that's at once recognizable and alien, which, to my mind, is exactly the right approach when dealing with swords-and-sorcery tales. Hawkmoon himself is a fairly attractive figure, neither reprehensible nor overwrought, which makes him stand out in a genre that contains too many examples of each for my liking. All in all, this is a fun book that kicks off a fun series. Even if you normally don't like Moorcock, I recommend giving it a try. The North Texas RPG Convention runs form June 5 to June 7 in Bedford, Texas. There will be a lot of noted old school designers and fans there, including Frank Mentzer, Paul Jaquays, Tim Kask, Rob Kuntz, Jason Cone, Allan Grohe, and Matt Finch. I wish I could be there myself, because it looks like it'll be a lot fun, but, like many such things, it'll have to wait till another year, when my schedule is more free. My daughter is fond of a series of hand-painted plastic figurines from a French company called Papo. They make a lot of very neat fantasy/fairy tale figures, in addition to some historical ones, like Romans, ancient Egyptians, Pirates, and, of course, Napoleonics. I was flipping through their 2009 catalog with her today and I came across this guy to the left. The catalog is bilingual in English and French. 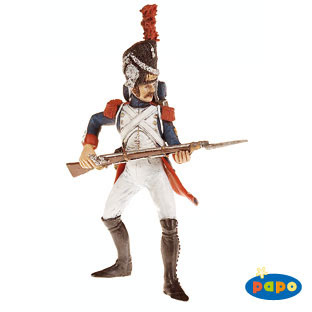 This figurine is called simply "Napoleon Soldier" in English, but his French name is "Le Grognard." If I ever manage to find one in a store, I think I may have to buy him. As someone who entered the hobby as part of its second generation, I find myself deeply fascinated by that first generation of gamers, my elders in the hobby. I knew and interacted with some of these people as a kid, meeting them in hobby stores or through one of my friends' fathers, who were wargamers. It was from them that I first learned of the legendary APA, Alarums and Excursions, in whose pages appeared many of the writers and ideas that would eventually infuence the hobby profoundly. A&E is one of the few unbroken connections between the present day and the dawn of the hobby, in part due to its indefatigable publisher, Lee Gold, whose labors have ensured its regular monthly release, with only two exceptions in the entirety of its 34-year existence. Lee graciously consented to answer a few questions about her involvement in the hobby and in A&E, which I reproduce here with my thanks. 1. How did you first become involved in the roleplaying games hobby? 2. Alarums and Excursions began in 1975 and now has published over 400 issues. Can you provide some background on A&E's origins? Alarums and Excursions #403 was the April, 2009 issue. #404 will be the May, 2009 issue. Deadline is typically the 21st of the month, at 5 PM Los Angeles time (so in the summer it's Daylight Savings Time). See here for further details. Back in 1974 or 1975, a number of us were discussing D&D and other RPGs in APA-L, the weekly APA collated each Thursday night at the Los Angeles Science Fantasy Society, a science fiction fan club. Bruce Pelz, a LASFSian and APA-Ler, who wasn't a roleplayer, was bored by all this and asked us to start our own APA. It seemed like a good idea so I did, offering to print contributors' zines for them. We started with gamers I knew: some in Los Angeles, some like the Hannifens in the San Francisco area, some like former-LA dweller Mark Swanson in the Boston area. And we spread by word of mouth. In August of 1975, my husband and I went off to Japan for four months when his employer transferred him there, and we returned in mid-December to find that Jack Harness (who I'd asked to edit A&E while I was gone) had only brought out three issues in those four months. On the other hand, he'd gotten more subscribers, a good thing. I set a firm deadline for January 1976, and got A&E reliably running again. Since then the only time we've missed a month was in 2006 when I knew I had major surgery scheduled, and announced well in advance that we'd be skipping the July 21st deadline. 3. Are there any articles from A&E that have stuck with you after all these years as being ground-breaking or significant? That is, are there any articles you consider classics? A&E is a collection of zines (each zine being a short amateur magazine, aka "fanzines" or "zine"), not "articles." A zine may include essays, comments on previous issues, poems or songs, a writeup of a gameplaying session, artwork, and just about anything imaginable. I remember zines from Dave Hargrave giving tidbits of the Arduin Grimoires, Steve Perrin's "Perrin Conventions" (which were the start of the system that later grew into Runequest), Ed Simbalist's and Wilf Backhaus's discussion of C&S, John T. Sapienza, Jr.'s discussion of various game systems, and other professional and semi-professional writers. I remember Mark Swanson's "character traits," a way of individuating characters with minor bonuses and minuses. I remember Wes Ives' essay on how to integrate player characters into a major wargamed battle (which later got republished in the C&S Sourcebooks). I remember a number of people (including myself) getting tapped to write games professionally because RPG publishers read their A&Ezines. I remember writing "You Bash the Balrog" (to the tune of "Waltzing Matilda." There have been a lot of wonderful contributions in A&E over the years. 4. In the early days of the hobby, APAs like A&E played a role very similar to that played by the Internet today. Has the rise of online sites, forums, and blogs had any effect, positive or negative, on A&E in recent years? Probably these sites (and also mailing lists and newsgroups) have affected A&E, but I'm not sure what all the effects are. Probably some effects are positive and some are negative. I think because A&E only comes out once a month, people take a bit more care writing their zines than they do for an online site, which will let them easily write in to correct or amplify their original statements only a few hours or a day or a week later, instead of having to wait another month. I think the greatest negative effects on A&E in modern times are the soaring cost of paper and of postage. I introduced the emailed electronic subscription some years back, when the postal service discontinued the Printed Matter rate to the non-US, and have since made it also available to those living in the US. About a third of the subscribers now take A&E electronically, rather than on printed paper. The emailed issue is only $2 total -- or free to anyone who contributed to that issue or the previous issue, but contributors pay $1.75/page contributed. 5. It's sometimes been said that the roleplaying scene on the West Coast was much different than that in the Midwest, where the hobby began. Do you think this is true and, if so, what would you say were the key differences between the scenes? I've played in LA, San Francisco and Boston, but never in the Midwest, so I can't compare Midwest Style to the styles I know. I do know that A&Eers weren't content with the D&D rules as written. Most of them dropped Vancian magic (use a spell once and lose it) for a spell point system which would let you throw the same spell again and again. Players typically had one or two PCs each, but never drone followers, so though there might be a formal "party leader" (sometimes a lieutenant in charge of strategy, plus a sergeant in charge of tactics), there wasn't one "party caller" as shown in Original D&D's sample adventure. We delighted in the flexibility of Original D&D: making up not just our own worlds but our own creatures and character classes, our own weapons and armor and spells. Bards showed up in an early issue of A&E, for instance. So did hoop snakes and larls and many other creatures from myth, legend, science fiction and fantasy. A&E still is a community with a lot of new ideas -- and discussion of previous months' new ideas. There are currently contributors from across the US, plus England and Ireland. In the past, we've also had contributors from Canada (one of whom still contributes but moved to Maryland), Australia, Scandinavia, Italy and France. 6. Do you still roleplay? If so, what games do you currently enjoy? I run a roleplaying game once a month, juggling a number of different campaigns. My gaming style is fairly freeform, but sometimes I resort to using my Lands of Adventure rules. I write up the month's adventures in A&E. My husband Barry is one of the players. The players include old friends, plus one old friend's teenaged daughter is also a member of the player group.